Two episodes in, and Tales from the Borderlands has quickly risen in the ranks as my favorite series from TellTale yet. It more convincingly pulls off the illusion of choice than The Walking Dead, feels far more coherent and focused than Game of Thrones, and is full of a more likable and sympathetic cast than The Wolf Among Us despite the moral ambiguity of most of them. Episode two, “Atlas Mugged,” has our dual protagonists Rhys and Fiona continuing to recount the events that led to their capture at the beginning of Tales from the Borderlands, starting immediately after the end of “Zer0 Sum,” where they met Borderlands antagonist Handsome Jack. Or, one of them did at least. Turns out, this AI made in Jack’s image is only visible to Rhys thanks to his mechanical implants in his eye. Jack has a plan to help our band of misfits make up for the vault key and money they lost in the first episode, and due to complications beyond their control, end up separated from each other. “Atlas Mugged” focuses on getting the group back together so they can act upon Jack’s plan. “Atlas Mugged” continues to masterfully weave together Tales from the Borderlands’ story and its framed narrative by taking advantage of the fact that Rhys and Fiona don’t like each other at all. Moments where one character’s take on something that happened seemed to be going off the rails with strange turns that I initially began to think were just poor jokes or dialogue on the writers’ part were often revealed as one character being an unreliable narrator, or having taken over the story being told at some point in order to mock the other, leading to what felt like a flat joke becoming a pretty hilarious one. Tales from the Borderlands continues to stand out among its TellTale brethren with its humorous tone, with it even bringing its own morbid black comedy into a few gameplay segments, including what was essentially Tales from the Borderlands’ equivalent of The Walking Dead’s stitches scene in Season 2, but with a much more comical tone that had me laughing in disbelief as I carried out some admittedly gruesome quick time events. 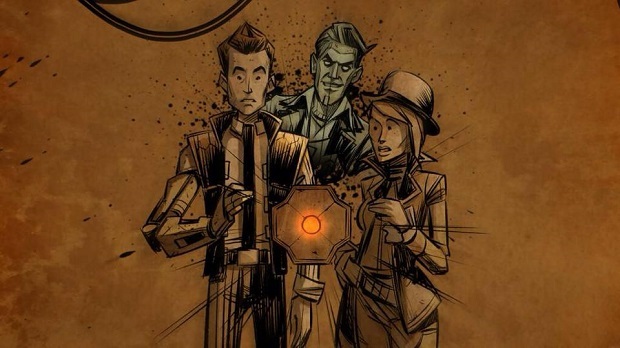 Undoubtedly, the greatest addition to come into Tales from the Borderlands in “Atlas Mugged” is none other than Handsome Jack himself. While this AI that Jack seems to have left behind before his death in Borderlands 2 doesn’t seem to realize that he’s less than the real thing, Jack’s dynamic with Rhys pretty much steals the show from beginning to end, all culminating in a pretty great choice right before “Atlas Mugged’s” credits begin. Jack will likely be a driving force throughout the series, but considering the circumstances that seem to have him tied to Rhys, it does make his absence in Tales from the Borderlands’ present day all the more puzzling, and a plot point I’m very interested to see more of moving forward. The one moment in which Tales from the Borderlands lost me was in a brief and superfluous shooting segment where the game arbitrarily changed control schemes to a third person shooter with a reticle and all. For not but a few seconds I had to aim and shoot enemies that were in my way, only for the shooting segment to be cast aside and never once again brought up or used. Why TellTale opted to break out of its QTE-driven setup for such a short and insignificant time was never clear to me, nor did it ever seem to be anything more than unnecessary. Hopefully this mechanic doesn’t come up again, or if it does, hopefully it seems less meaningless and unnecessary. Even with Tales from the Borderlands’ more whimsical nature, in “Atlas Mugged’s” final moments TellTale seems to hint that this series is going to start getting more personal with its decisions and the ramifications of choices that you make. Given the nature of Borderlands, I doubt that we’ll ever have to see a moment like the ending of either season of The Walking Dead, but perhaps soon we’ll get to the point where Tales from the Borderlands feels like its decisions carry greater weight alongside being a more entertaining and less dire story than the studio’s other projects. Tales from the Borderlands continues to set itself apart from other works by TellTale, and is showing a great potential to surpass all of them with direction and focus that other series have lacked. Hopefully episode three, “Catch a Ride,” won’t take as long to come out as “Atlas Mugged” did.